Biblical patience is far more than just a slowed pace or a sacrificed schedule in order to meet the the needs of others. This patience draws from a determined will emboldened by a partnership with the Holy Spirit. The world’s hurried pace weakens our resolve and distracts us from the need to develop this inner muscle. In order to gain spiritual sinew, we must spend more time in God’s gym. We must work out regularly under the tutelage of Heaven’s ultimate Trainer, the Holy Spirit. Your living witness to the power of the Holy Spirit (Patience) may be the one thing most necessary to help your friends understand how to survive the coming onslaught of spiritual compromise. Time is short. Live like their tomorrow depends upon you! Make it real! 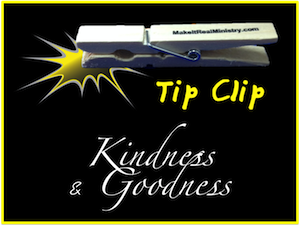 The "Tip Clip" is simply a clothespin used to jog your memory. Place your "Tip Clip" in a spot that will give you daily reminders to work on the Holy Spirit characteristic of Patience. (Examples: Carry it in your pocket, attach it to the computer monitor, or hook it to your favorite coffee mug.) Use the tips below to help you grow in this area. Tip: Inner toughness requires intent. Tie a string around your finger. When you see it, think of your eternal nature. Slow down! You’ve got forever! Back to Top of "Patience: Characteristic of the Holy Spirit"